If you could put the experience of San Diego Comic-Con International into a box, what would that box look like? Matt Arevalo and Chris Davis of subscription box service Loot Crate think they have the answer. 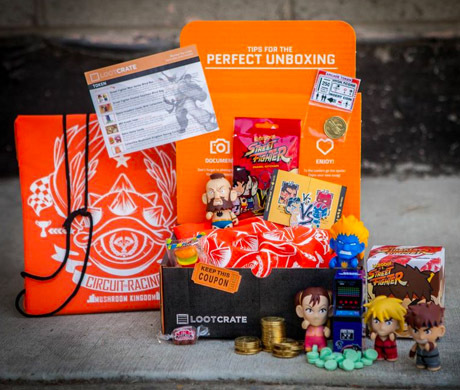 For about $13 plus shipping and handling, geeks and gamers can get their hands on a monthly assortment of goods from Loot Crate’s partner brands, ranging from big-name gaming companies like Nintendo and Blizzard to figurine manufacturers like Funko. 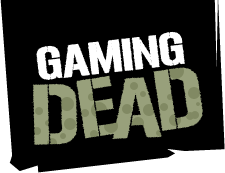 Gaming Dead sat down with co-founder Matt Arevalo at SDCC to unbox just what Loot Crate is all about. Loot Crate is barely a year old, but it managed to acquire a very good position for its booth at this year’s San Diego Comic-Con International Exhibit Hall, a feat that some sources say could take up to six years on a waiting list. At the booth, they sold individual items from former Crates and networked with potential future Loot Crate partners, the current roster of which includes the previously-mentioned Nintendo, Blizzard, and Funko, as well as officially-licensed Star Wars products, both Marvel and DC Comics, and other household-name brands. With such big name companies already demonstrating such trust in Loot Crate, it would be no surprise to see even more geek-and-gamer favorite companies jumping on the Loot Crate bandwagon. Beyond what Arevalo calls “top-tier” companies, Loot Crate also aims to work with indie developers to create monthly themed crates that include everything from snacks and useful gadgets to beta keys for forthcoming game titles, or digital goods for current games. But Loot Crate isn’t all about the gamers–nor is it all about the general “geek” experience. A oft-expressed phrase heard around the Loot Crate booth was that it’s “the Comic-Con experience in a box.” Meant to appeal to those interested in North America’s largest “celebration of the popular arts,” it’s not just about video games or general geekery. Comic-Con itself is difficult to define, which is why it continues to draw crowds upwards of 130,000 annually, especially in recent years with big-name stars, world-premiere announcements, and exclusive items sold. It thus makes sense that what Loot Crate is trying to tap into is the very lifeblood of “geek” culture: a love not just of video games or movies, but video games and movies and comics, and TV shows and Internet memes, and so forth. 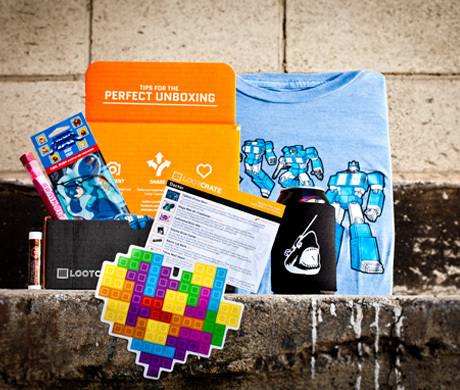 What sets Loot Crate apart, in a quickly-growing field of curated subscription box services? To start, it’s one of only two such companies targeting the geek-and-gamer crowd, the other being Booty Bin. Per the subscription box review website SubscriptionBoxes.com, Loot Crate has garnered an impressive 4.75 star rating out of 261 reviews, with most comments touting Loot Crate’s “cool” and “useful” items, along with their impressive customer service. Booty Bin, on the other hand, has slightly over a 4-star rating out of just 30 reviews, with some comments impressed and others mentioning how the items seemed like they were from “a dollar store” and not worth the almost-double monthly cost that Loot Crate charges. “There’s no other subscription box company that’s here,” Arevalo points out. Though the Exhibit Hall at SDCC featured hundreds of exhibitors and retailers, only Loot Crate represented the burgeoning subscription box market. That market started out geared primarily toward women, with subscriptions like the beauty product-filled Birchbox, but has developed to include niche subscription boxes for everyone from bicyclists to new moms, scrapbookers to snackers. When you compare Loot Crate to the established subscription box companies, it has both strengths and weaknesses. Its biggest strength is probably its app; unlike many other subscription box services out there, Loot Crate goes beyond the once-a-month unboxing and allows users to socialize via the app, or their Facebook page, YouTube channel, Twitter or Instagram feeds. All of their social media networks are gathered into one place via their iOS and Android apps, as well as polls, local events, music/audio, a chat wall, and a category view for content. This keeps people talking about Loot Crate all month long and, before they know it, another new box has arrived at their doorstep. Why the app? “Other subscription services have a million-dollar website or a celebrity [endorsement], and they think that people will just fork over their money,” Arevalo says. “But this [the geek-and-gamer community] is a community that doesn’t want to be sold to.” Rather, Arevalo explains, the geek and gamer community wants to share in the experience, and the app enables and promotes that sort of sharing. Beyond socializing, Loot Crate’s low price point makes it accessible to geeks and gamers of all stripes. People can sign up for the monthly subscription at $13, but the price per month only gets lower if someone agrees to pay for a three-month or six-month plan upfront instead. Unlike similarly-priced subscription boxes, the items in a Loot Crate are fully-featured–not mere samples, for the most part, unless you count “samples” of candies and other snacks. Consider the Bic Stylus 2 in 1 pen that Loot Crate included in their June Crate, for the theme “Mashup.” That one item retails for about $5 for a single pen, and with at least five to seven other items in each Crate, it’s easy to see how you get more than your $13 worth with each shipment. Loot Crate guarantees each Crate will have a $30+ suggested retail value, although one lucky winner each month gets what’s called a “MegaCrate,” with enough items to raise the value of the Crate upwards of $250. Yet every awesome thing has its weaknesses; Loot Crate’s might be apparent mainly to those familiar with subscription box services and their features. For example, Loot Crate offers no built-in option to trade items; when some Crates include variant items like the Star Wars-themed bobbleheads from Funko from their March 2013 “Cosmos” bundle, there was no way to trade with fellow Looters for the variant you might have wanted but didn’t get. Similarly, if you’re not too into the theme of a month, there’s no way to skip and earn credit, or simply pass and not be charged for one month. Some subscription box services offer smaller or larger boxes at different price points, offering different memberships depending on how much people want to pay. For example, the fashion-and-beauty subscription box service, Little Black Bag, offers users the chance to pick their own “opening” item at a price that is heavily discounted (up to 70%) off retail. Then, the “stylists” (curators) pick other items to go along with the first one–usually about 1-2 items. Depending on the “opening price” of the first item, the total can be anywhere from $12 upwards to $75. VIP members can opt out each month and accumulate $10 credits, rather than being charged for a full month where they either didn’t want or can’t use the items in each box. Loot Crate does allow members to specify things like shirt sizes, but that’s about it; there’s no quiz to find out what kind of geek or gamer you are, and no way to tailor any of the contents that are inside the box. By subscribing, you are putting your geekery into someone else’s hands–for better or (rarely, it seems), for worse. “We’re at a size now where we can do exclusive items,” Arevalo says, such as the exclusive Funko + Star Wars figurines they had featuring Han Solo and Luke Skywalker Stormtroopers or Shadowtroopers. These are short runs by manufacturer standards, but because of Loot Crate’s rise to popularity, with over 10,000 monthly subscribers, these short runs can be justified monetarily; figurines will not just be sitting on a warehouse shelf. Rather, these exclusive figurines only bring Loot Crate and their partner manufacturers and brands more attention, with fans staging elaborate “unboxing” images, videos, tweets, and more on multiple social media outlets.Nonetheless, Loot Crate is clearly driving the bandwagon, rather than jumping on it after the fact. Though subscription boxes have been around for several years at this point, they have only in recent history gained popularity in the mass market, and appealing to specific groups seems to be a key to success for these startups. By entering a huge but untapped market of geeks and gamers, Loot Crate has positioned itself to dominate, especially with the allure of possibly winning a MegaCrate that includes brand-new items, such as this fall’s forthcoming Xbox One or PlayStation 4 consoles. How does Loot Crate know what will be popular with their intended audience? “We have to forecast several months in advance,” Arevalo explains, adding that many times the themes each month come about from a combination of knowing what products will be available in the necessary quantities by their deadline and as unique partnerships are made. 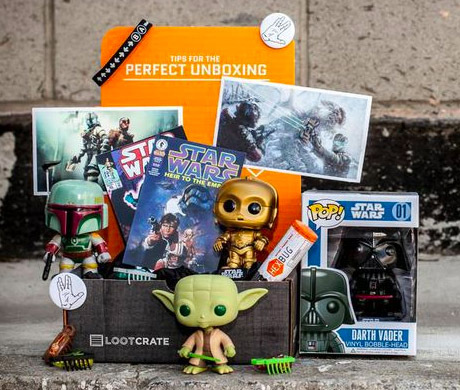 Loot Crate knows when its boxes are a success when it sees people participating in its contests, lighting up its social media channels, and generally having a good time unboxing and enjoying the contents of their crates. There have been video unboxings that feature folks in cosplay, people unboxing in unusual locations, folks unboxing their items while blindfolded, or sometimes just tearing open their box like a kid at their birthday party. “Here you have people making the product[s] look interesting,” Arevalo says of Loot Crate’s YouTube channel. Bic probably didn’t expect to see their product mentioned by so many people not in the office supply industry, especially by highlighting it by drawing something with either the pen-side or the stylus-side on a tablet or phone, per a Loot Crate-sponsored contest. So the unboxings act a sort of free advertising, not just for Loot Crate, but for their partner brands and manufacturers as well, as people demonstrate their real excitement over their items. When asked if there’s a dream company Loot Crate would love to partner with, Arevalo says “We’re doing well, and we’re excited to work with anyone that’s a little bit different.” Loot Crate’s founders and team members rely on “knowing what companies out there people respect and admire,” and yet Aravalo says that they intentionally “look for items and products that make sense [with the theme] and are really useful.” It wouldn’t be unusual, he says, to see a really cool USB stick or a universal phone charger included in one month’s crate; it would be a prime example of something that people would really like. The elusive combination of geeky-fun and useful means that it’s difficult to predict what any given crate will contain, even if you know the theme. Speaking of themes, July’s theme, shipping to Looters now, revolves around the popular webseries Video Game High School, where the VGHS team curated the items in this month’s crate, including a season 1 DVD of the series, Star Wars-themed earbuds, and a Sonic the Hedgehog air freshener (yes, really). As for next month? Arevalo’s got his lips sealed, but he did let slip that the following month’s crate will have a theme revolving around a popular computer game company. There’s no official roadmap for Loot Crate’s future. From its somewhat-humble startup weekend beginnings, where the idea was cultivated and executed in just 54 hours to its current subscription base of 10,000 “Looters” and growing, Loot Crate is on its way up in the world. “We are going to continue to expand the business,” Arevalo says. We can’t wait.